Ren Junod, La Chaux-de-Fonds, Switzerland; sale, Christie's, London, 1 December 1986, lot 15. L. Venturi, Czanne, son art--son oeuvre, Paris, 1936, vol. I, p. 144, no. 364; vol. II, pl. 99 (illustrated; dated 1879-1882). L. Gowing, "Notes on the Development of Czanne," The Burlington Magazine, no. 639, vol. XCVIII, June 1956, p. 188 (dated 1877). S. Orienti, The Complete Paintings of Czanne, New York, 1972, p. 108, no. 465 (illustrated). M. Hoog, "Une Nature Morte de Czanne Reconstitue," La Revue du Louvre et des Muses de France, no. 3, 1992, pp. 64-66, fig. 5 (illustrated). J. Rewald, The Paintings of Paul Czanne: A Catalogue Raisonn, New York, 1996, vol. I, p. 320, no. 481; vol. II, p. 154 (illustrated). Zurich, Kunsthaus, Paul Czanne, August-October 1956, no. 39. This arrangement of fruit on a seemingly inclined tabletop is typical of the still lifes that earned Czanne the title of "le peintre des pommes" (T. Natanson, "Paul Czanne," La Revue blanche, vol. XI, 1 December 1895, p. 500). 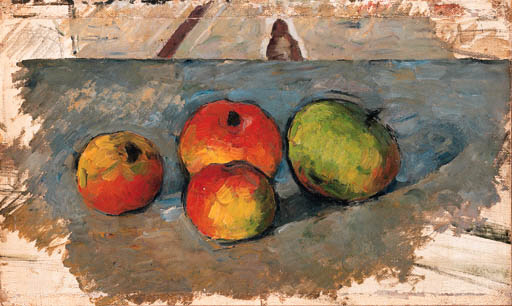 Although the picture is intimate in format, the four apples are depicted in monumental, iconic simplicity. Scholars disagree on the exact dating of Quatre pommes. Their discussions mainly revolve around the wallpaper in the background, and its use in one of two Paris apartments. Czanne was living at 67, rue de l'Ouest intermittently between 1877 and 1879 and at 32, rue de l'Ouest from 1880 through 1882. The first apartment's wallpaper consisted of blue crosses and faint diamonds on a yellow ochre background (Rewald, nos. 322-328). Rewald argues convincingly, however, that although the pattern in Quatre Pommes is similar, the olive toned, deeper coloring suggests that it is from the second apartment (Rewald, nos. 478-480, and 482). The two other fruit still lifes from this period, Assiette avec fruits et pot de conserves, 1880-1881 (Rewald, no. 480), and Pommes, serviette et bote lait, 1880-1881 (Rewald, no. 479), are respectively in the Barnes Foundation, Merion, Pennsylvania, and the Muse de l'Orangrie, Paris.